Home » Lent » Prayer » Prayer Lists » Our Lenten Prayer List ~ A Chain of People! One of the things our family is doing this year for Lent is to pray for a person or group of people each day. Together we created the list and wrote the list down on a calendar so we could remember who we were praying for each day during Mass and/or our daily rosary. Since my younger kids have been enjoying those cute little people images I created for my last craft project I recruited them to color one of the little people patterns for each of the people on our prayer list. This was a great activity to keep them busy while I was teaching the bigger kids their school lessons! 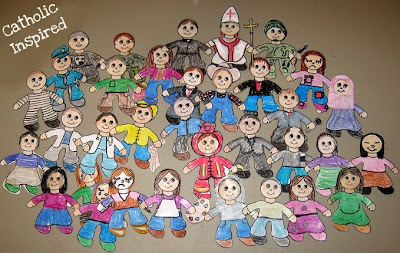 The kids had a lot of fun being creative when making the different people! 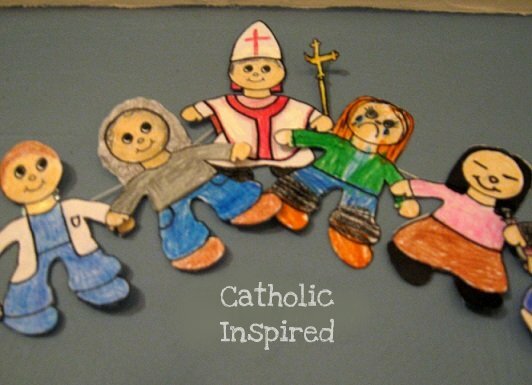 They created all sorts of people from our prayer list including a firefighter, policeman, doctor, pregnant woman, politician, farmer, a person who is sad and one who is poor, as well as a priest, the pope and lots of other interesting people. I think I have "The Village People" hanging in my kitchen!! these are too cute, Jennifer! thanks, we'll definitely use these little people!! 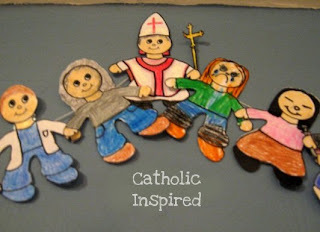 I love the idea of praying for people as a Lenten activity with children. What a great idea, Jennifer. Thank you for sharing this unique idea! 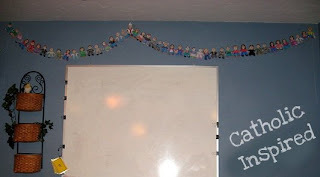 It is a great way to make praying for someone a tangible thing for the kids. 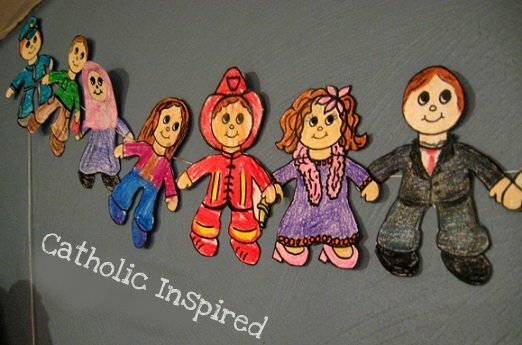 What a wonderful way to help the children in their prayers! Too cute! That's a great idea Jennifer! It's more meaningful to children to have a picture with their prayer intention... at least, I think it does! This is priceless. I'm not sure I could have that many people staring at me during school, but i think the cute factor would get me through it. Great way to remind the kids that we are praying for real people! So adorable! What a concrete way to show our kids the importance of praying for each other. Thanks for the idea! This idea was a HUGE hit in our family! 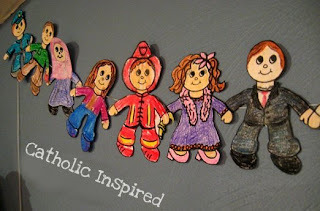 We, too, chose a person/family to pray for on each of the 40 days of Lent. Then my children proceeded to make the people - some families have up to 10 children - and each one is represented...105 in all...taped onto a purple yarn and hung in the window near our kitchen table. We added a sign next to the string of people that reads: Lord hear our prayer. Today is the ____ day of Lent and we are praying for______. Finally, we added an arrow to point out the person/family/group who is the focus of our prayer for the day. Beautiful! 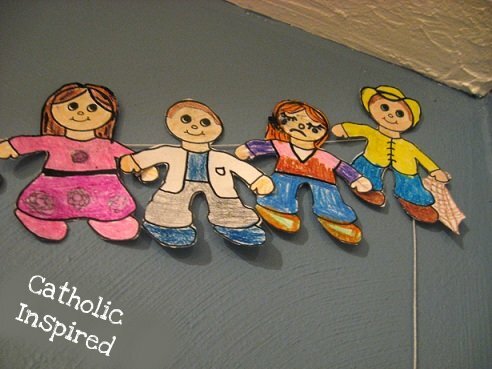 While I found and printed off the Little People sheet during Lent, I used it for another purpose. My youngest was born with a heart defect and he's been prayed for A LOT. We also pray daily for his "hospital and Caring Bridge prayers, especially...." The list of names changes depending on hospitalizations or other circumstances. What I've done is print a sheet and let him color it, then we write a name on each person/child and I hang them his bedroom door. Everyone who walks by can read the names and keep those children in their prayers. THANK YOU for making this a more visible activity!